Christian Escoudé is born in 1947. His father, gypsy and guitarist, plays in the popular dances of the region. His father has boundless passion for Django Reinhardt that he passes on to his son and introduces him to the guitar at the age 10. Five year later Christian begins a musician's career. Christian Escoudé is part of a small jazz guitarist's familly coming out from the Manouche circle: Thus, he built up his own guitar style, a mix of be-bop approach widely tinged with Tzigane influence. He demonstrate a great melodic feeling, using “gypsy” inflexions , such as vibrato and portamento, hot runs and a large, profound sound. He distinguishes itself by the quite personal way it uses arpeggios on the systems semitone / tone. At the Jazz In, where he plays «after Hours» in 1972, he met with the trio of Eddy Louiss, Bernard Lubat and Aldo Romano. Later on he join Didier Levallet's”Swing String System”, and Michel Portal'sMichel Portal Unit. In 1976, l'Académie du jazz award him the Prix Django Reinhardt, meanwhile a new quartet take form with Michel Graillier, Aldo Romano, and Alby Cullaz the later soon replaced by Jean-François Jenny-Clark. He can also be heard (as free-lance) alongside Michel Portal or with Slide Hampton, Martial Solal and Jean-Claude Fohrenbach. In 1978, the Festival de Nice offers him the opportunity to records with the quartet of John Lewis as well as to play with Stan Getz, Bill Evans, Philly Joe Jones, Freddie Hubbard, Lee Konitz, Shelly Manne, Elvin Jones... Starting in 1978, He participates almost every year to the Festival de Samois, organized in homage to Django Reinhardt. In 1979, he perform at the Festival de Dakar, as guest of the René Urtreger's trio with Pierre Michelot and Daniel Humair. Summer 1980 : John McLaughlin invite him to tour in a duo setup, this take them to the United-States, Brazil and Japon. of the Martial Solal's big band. The following year, he perform in quartet alongside Shelly Manne. Back in France, he create a quartet with Olivier Hutman (claviers), Nicolas Fitzman (b, bg) et Jean My Truong (perc) - the last two will be later replaced by Jean-Marc Jafet et Tony Rabeson. In 1983, he start a duo with Didier Lockwood which turn into a trio in 1984 with the addition of Philip Catherine. In 1985, he perform with Capon and Carter then he creates the “Trio Gitan” with Boulou Ferré and Babik Reinhardt. In 1987, he play's in duo with Michel Graillier, with John Thomas, continues playing with the “Trio Gitan”, and again with Capon-Carter. A the start of 1988 a new quartet is born with Jean-Michel Pilc, François Moutin et Louis Moutin. The following year, he setup an octet composed of four guitars (Paul Challain Ferret, Jimmy Gourley, Frédéric Sylvestre), accordion (Marcel Azzola), cello (Vincent Courtois), bass (Alby Cullaz) and drum (Billy Hart). In New York, 1990 : He play's at the Village Vanguard with Pierre Michelot, Hank Jones and the drummer Kenny Washington. In 1991, surrounded by a string orchestra, he records eleven compositions from Django Reinhardt. In 1992, his “Gipsy Trio” (Challain Ferret, Sylvestre) growth with Babik Reinhardt or Bireli Lagrene, the following year, in Los Angeles, he records with Lou Levy, Bob Magnusson et Billy Higgins. In 1998, He creates and records A Suite for Gypsies, a Jazz rock, fusion composition dedicated to the memory of gypsy's childrens dead in the nazi's camps. In 2003, year of the fiftieth birthday of DJANGO REINHARDT's death, he creates a big band (17 musicians) with whom he il explore the musical inheritance of Django while adding his own style and own harmonical and rythmical ideas. In 2004 he setup « The New Gypsie Trio », a group of 3 guitarists with the necessary open mind to express a timely musical concept, without disavowing their own musical roots (with David Reinhardt and Martin Taylor orJean-Baptiste Laya). In mars 2005 his last album, distributed byNocturne, “Ma ya. Ya” with his new sextet (Progressive Sextet) with : Marcel Azzola, Jean-Baptiste Laya, Sylvain Guillaume, Jean-Marc Jafet, Yoann Serra. Under the label EmArcy, Verve's parisians office contract him for 7 albums from 1989 to 1994, : Gipsy Waltz / 1989 / Marcel Azzola / Live at the Village Vanguard / Plays Django Reinhardt / In L.A.-Standards Vol.1 / Cookin’in Hell’s Kitchen In 96 the album “Live at Duc des Lombards”. In 98 : “A suite for Gypsies”. 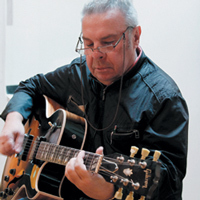 As of now, Christian Escoudé has composed or participated to revording of over 50 albums. Courtesy of All About Jazz. Escoude's Plays Brassens reviewed in JazzTimes! Christian Escoude's Plays Brassens gets a nice review in JazzTimes!